Go big? Or go even bigger? You decide. Home theater can be crazy confusing, especially if you’re just starting out. And one of the biggest decisions you’ll need to make is whether to go for a basic five-speaker system (plus a subwoofer, because who wouldn't want that bass?) or a more powerful seven-speaker system. While anybody who has experimented with speakers and amps for a while can probably skip this particular How-To, beginners and intermediate users will probably pick up a lot of good information. Even if you just have a desire to get yourself some slightly better sound than your TV is giving you, you’ll probably get plenty of use out this, and we've included plenty of tips and tricks. So let’s jump right in, and talk about the differences between 5.1 and 7.1 systems. First, a quick refresher, so we're all on the same page. When we talk about a home theater system, we always preface it with a set of numbers. The most common are (as you will know already if you’ve read the title of this article and are only mildly awake) 5.1 or 7.1. Both refer to the number of speakers in the setup. A 5.1 system consists of five smaller speakers and one subwoofer. 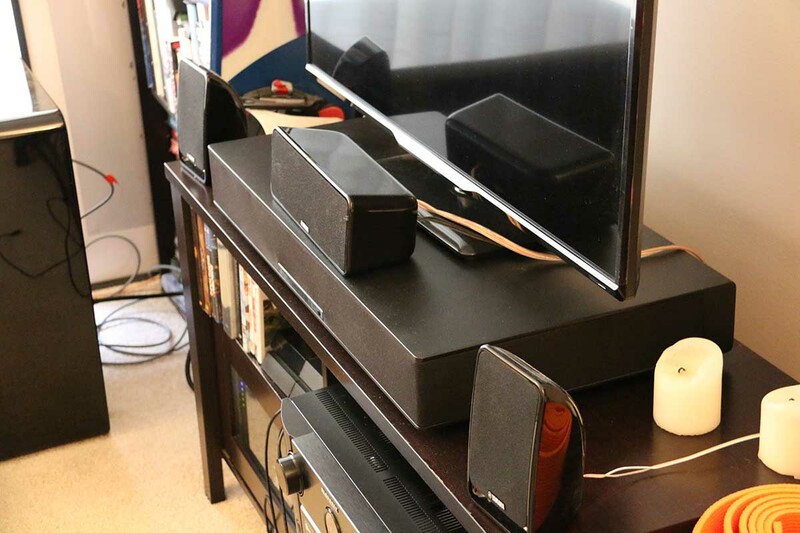 The subwoofer handles the bass, while the five additional speakers handle everything else In this particular setup, you will have a center speaker that sits directly in front of your listening position, underneath your TV. On either side of it will be two front speakers - these can either be smaller satellites, or big floorstanding speakers. The remaining two speakers usually sit to either side of your listening position – so one on each side of your couch. The subwoofer can occupy various positions, but is most commonly placed in a corner, or to one side of your TV. One of the big advantages of 5.1 systems, which we'll go into in a little more detail below, is that they are self-contained. You can buy them in a single box, without any additional equipment needed. A good example? Try the Onkyo HT-S7800, a simple set of speakers that comes with its own receiver – which, by the way, is the hub that you’ll run everything into, and which connects your speakers to your TV. Then there’s 7.1. Now, very obviously, this is the same set up with two additional speakers added – only this is where things start getting complicated. Those two additional speakers could be identical to the ones on either side of your listening position, only placed behind it. They could be height speakers, that are bolted to the wall, facing downwards. This is where you really start to get the full surround sound effect. If you’re looking to get involved with this many speakers, try something like the Infinity Reference 7.1 Home Theater Speaker Package It doesn’t come with its own receiver, but that’s not uncommon among bigger systems. Of course, you can go bigger. Much bigger. By now, you’ve probably worked out the numbering system, so if we tell you about a 9.2 or 11.2 system, you’ve almost certainly got a good idea of what this entails. It can actually get quite complex – we’ve seen systems that are 9.2.4, which is nine surround speakers, two subwoofers, and four speakers installed in the ceiling. On a related note, Mad Max: Fury Road sounds badass through that system. Whichever home theater system you decide to go for (and were going to stick to 5.1 and 7.1 here, otherwise we’ll be here all day) you need to be aware of the pros and cons. 5.1 first. It’s got several distinct advantages: the systems usually come in a single box, as we’ve mentioned, meaning there’s no need to invest in additional components - although of course, that's always an options. They are also relatively easy to set up and place, which can be a real boon for smaller rooms. They are inexpensive – it’s possible to get a good 5.1 system for under $1,000 – and depending on the receiver they come with, eminently customisable if you ever decide to go that route. And even if you buy the cheapest one available, it’s going to be an immediate upgrade to the sound coming out of your TV. You’ll notice this the moment you watch a movie, or play a game, or load up a series on Netflix, or do anything that has surround sound capabilities. You're also far more likely to find wireless systems here - and for anyone who has ever spent an afternoon stripping and twisting speaker wire, that's probably a huge relief. If you’re into checking out wireless systems, they come in both 5.1 and 7.1 variants. For 5.1, try the Enclave Audio Cinehome HD 5.1, and if you fancy adding some rear speakers, we recommend the Axiim Q HD. It’s a 5.1 system, but can easily be upgraded to 7.1. Of course, they do have a downside. A couple, actually. They can feel underpowered, compared to bigger systems, and they simply don’t have the depth or precision of those setups. More importantly, if you are in a larger room, they are simply not going to be adequate. For the most part, these systems are composed of satellite speakers, which are small and light, and can be placed easily. That’s fine – but it does come with the caveat that they aren’t going to be nearly as powerful. In addition, while wireless systems are far more convenient, in that they don’t clutter up your listening room with wires, sound quality can sometimes suffer, and you will need to plug each speaker into a power socket. Wired speakers almost always sound better, but do have the disadvantage of needing ugly speaker wire, which you’ll almost certainly have to purchase separately. 7.1 systems, on the other hand, make their advantages known immediately. Increasing the number of speaker channels gives you richer surround sound, and at the price ranges they usually operate at, the speaker build quality and audio capabilities are usually way, way ahead of any 5.1 system. While not all packages come with the receiver, they do demand that you have one, and any you invest in will almost certainly allow you to easily upgrade your existing system, should you choose to. Downsides? 7.1 systems can be expensive. Actually, scratch that can – in almost all circumstances, they are pretty pricey. The only way they wouldn’t be is if you take a 5.1 system, swap out the receiver for something with a bit more meat and more channels, and add in a couple of additional satellite speakers, but this Frankenstein -like configuration is never going to be a patch on a purpose-built 7.1 system. And if you try to deploy a 7.1 setup in a small room, you’ll quickly find that the sound becomes muddy and unfocused, as you need a little bit of distance between you and the speakers to get the effect you’re looking for. How big is your room? If it’s larger than around 350 square feet, consider a 7.1 speaker setup. If it’s smaller, a 5.1 may be more appropriate. Where is your listening position? Do you have room behind it? If so, consider a 7.1 setup. What type of furnishings are in your listening room? How many flat surfaces do you have in relation to the number of soft surfaces or bookshelves? We'll go into this a little more below. Are you likely to want to upgrade your surround sound at any point? Could you see yourself investing in height speakers? If so, go for a 7.1 system, with a compatible receiver. Do you prefer wired or wireless systems? If you need excellent sound and don’t mind wires, then go for wired. If you can compromise a little on sound, and have multiple plug points available, go for wireless. When you’re deciding which system to go for, this is probably the most important thing to consider. It’s not just about a system being unable to fill a larger room, or a system that is too big swallowing the space in a smaller room and muddying the sound – not to mention taking up actual physical space with speakers and speaker wire. It’s what’s in the room itself. Ideally, we’d all have a dedicated rectangular media room, with a listening position on a comfortable couch (with La-Z-Boy functionality and built-in cup holders, if you please), with walls that have been acoustically proofed, and speakers that are in precisely the right position. But most of us don’t. The vast majority of us don’t. For most people, the 5.1 or 7.1 system will be installed in a lounge or living room, and it will be filled with objects that will do funny things to the sound. Bookshelves. Coffee tables. Vases. TV stands. Paintings. The bicycle that you’ve told your ten-year-old a million times not to leave in the living room. On top of that, there’s a pretty good chance your couch is probably pushed up against the wall, or at the very least, not exactly in the ideal listening position for the space. You might want to position rear speakers on speaker stands behind you, but they might very well get in the way. Broadly speaking – and we really are talking very broadly, because acoustics is a vast science – there are objects that are good for sound, and objects that aren’t. A full bookshelf does good things to sound, because it absorbs the majority of the soundwaves, allowing you to hear what’s coming out of the speakers more precisely without it being muddied by reflections. Ditto for couch cushions, drapes, beanbags… Anything soft or uneven, really. On the other hand, walls, ceilings, paintings – anything flat and reflective – is going to complicate things as they reflect sound waves back into the room. In extreme cases, two parallel walls will create what is known as a standing wave: a low-frequency resonance that pops up as sound is reflected between them. Ultimately, a good way to approach it is as follows. Evaluate the size of your room – anything up to 350 square feet (roughly) will be just fine with a 5.1 system, while anything above that would almost certainly benefit from a 7.1 system. Take a look at what you have in the room, and if possible, try to maximise bookshelves and soft furnishings (especially the bookshelves, because books are cool). Then pick the type of system that suits the size of the room. And look: we know this is inexact. We understand that. Every single room is going to be different, and all we can do is provide some general principles. As long as you’re aware of them, and pay attention to your surroundings, you should be fine. If you’d like more guidance, check out these setup diagrams from Dolby. A word on subwoofer placement. Placing the surround speakers is relatively simple: centre speaker under the television, front speakers on either side, and side speakers on the left and right of the listening position. Rear speakers behind it (for 7.1), roughly mirroring the position of the front speakers. But the subwoofer needs to go at floor level, Which opens up a whole can of worms. Traditionally, the subwoofer is placed on one side of the TV, or in the corner, or in some cases along the side of one wall, pointing inwards. If you can, try to keep it close to the front speakers, which will help the illusion that the bass is coming from there. A good way to fine tune placement is as follows: put the sub, wired up, in your listening position – we know it’s weird – then, with something playing, walk around the room, or even crawl around at floor level. See where the bass sounds best. That’s where you want to put your subwoofer. And just remember: good base isn’t just loud, it’s also rounded, clear, and accurate. It shouldn’t blow your head off. Or your neighbours’. Some slightly more expensive systems offer a fantastic way of getting the most out of your setup, which is room calibration. Essentially, this allows the system to fine tune the performance of the speakers to suit a given room, which (inappropriate room size aside) will help get the most out of your purchase. How this works is that usually, the receiver will come with an external microphone, that is connected to it and placed in a series of listening positions around the room. The receiver plays a variety of test tones, which are reflected around the room and captured by the mic, essentially giving the receiver’s processors a picture of your listening environment. When it’s got this, it can use its built-in equalisers to adjust what you’re hearing, in order to maximise the clarity of your system. Calibration systems do vary – and they are much more common in 7.1 then 5.1 systems. The one we’ve been experimenting with lately is particularly good: the one that comes with the Marantz SR7011 (full review here) actually has a cardboard stand that allows you to raise the microphone to the desired height, and its built-in Audyssey EQ is particularly good. And in most cases, you'll hear an immediate improvement in your sound, especially in your regular listening position. It's the kind of thing which can make a major difference, and where possible, we'd urge you to go for it. But what if your system doesn’t come with room calibration? Not to worry. You can still do it – although it’s a little more complicated. You’ll need to invest in something like the Digital Video Essentials: Optimize Your Home Entertainment System DVD. Let’s put it this way: we all want height speakers. But most of us don’t need them. For starters, the more speakers you add onto a system, the narrower the range of entertainment that can actually provide dedicated channels to those speakers. Almost all Blu-rays these days are capable of high level surround sound mixes, so if that’s what you listen to, then you should absolutely invest in them. But if your entertainment diet consists of cable news, or Netflix, or even most videogames, then chances are height speakers will be wasted on you. Not in the sense that you want appreciate them, but in the sense that they won’t be performing to nearly their full potential. Oh, they’ll still make noise. In some cases, beautiful noise. The problem is, it won’t be noise specifically designed for height systems. It won’t sound off, or wrong, but it won’t be nearly as good as it could be. Then there’s placement, which for height speakers, can be a pain. You’ve either got to bolt them to the wall, or position them on a high bookshelf. Depending on whether you own or rent, the former may be unachievable. If you are thinking of checking out height speakers, you could do worse than invest in the absolutely superlative SVS Prime Elevations (full review here). They not only do the job of height speakers, but their angled body and multi-placement options mean you can use them in a number of situations. Ceiling speakers - as in, ones actually installed into your ceiling - are a little bit trickier. The principals are the same but the actual installation process and oodles of speaker wire are not, and you'll need to be really convinced they'll help before you embark on knocking holes in your roof. By all means, go for it, but be aware that it's tricky. DTS:X is probably the simplest. It doesn’t require a minimum number of speakers, and is purely software-based. It’s also got excellent conversion capabilities, turning even audio that doesn’t have surround sound mixing into something that can be put out through a surround sound system. Dolby Atmos is a piece of software that uses height or ceiling speakers, and specifically requires them. You will almost never find this on setups below 7.1, although if you have the room size in the budget, it’s well worth experimenting with. Then there’s Auro-3D: a highly specialised, deeply cool speaker setup that relies on something called the Voice Of God speaker, which is installed in the ceiling. This is the least common of the three, although its integration is becoming more widespread. 5.1 users definitely need not apply. Come to think of it, you couldn’t run a conventional 7.1 system through it either; by definition, adding height speakers would turn it into a 9.1 or even 11.1 system. Just remember: knowing about these is helpful, but shouldn’t affect the system you pick. You should choose the right number of speakers for your room, and calibrate them correctly, rather than worrying about the type of surround sound codec. Consider this extra information. For our money, this is absolutely the finest 7.1 system that money can buy. The speakers, from the company’s magnificent G range, are absolutely superlative, offering lifelike sound and huge bass. Although Klipsch has plenty of additional options, we still swear by these. While you will pay a significant amount for them, you absolutely get what you pay for. This is one for bigger rooms - as you'd expect, given the technology prevalent in each driver. Plus, the package linked above actually comes with an included receiver, the superb Denon AVR-X2100W, which will more than do the job, handling just about anything you can throw at it. We've mentioned this one already. It's a terrific 5.1.2 system (as in, with room for two height speakers, although it's quite capable of just being run as a 5.1) that delivers quality components from a brand that tag-teams with Klipsch as the two most dominant companies in home theater. It's an in-the-box system, meaning it comes with a receiver included. Setup is as simple as it gets, and the sound has been highly-tuned to get the best out of the individual speakers. One of the best available, and ideal for slightly smaller rooms. Andrew Jones is a name that gets thrown around the home theater world a lot - and with good reason. He's worked with KEF, Pioneer, Infinity, and is now part ELAC, and his speaker designs are legendary. Although many consider his TAD Reference One speakers to be the best ever made (and at $80,000, they'd better be) his Pioneer speakers still stand up. The SP-PK52FS is a perfect starter 5.1 system. It has big, booming sound that really fills up a room, and it looks absolutely terrific, with smooth wood panneling and a dark color scheme. And there's no need to remortgage your house to buy it. Hooray! When they’re not producing the world’s best headphones, French audio wizards Focal spend their time producing some rather good speaker systems. We recently spent a month with one of these, the Focal Sib Evo 5.1.2.